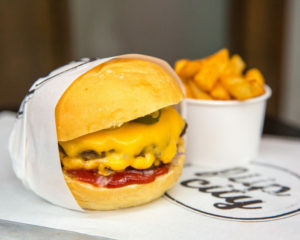 Flip City Burgers is where it all started for Dani Zeini and Terri Tep of Royal Stacks – The Flip City burger was originally available as a secret menu item at Dandenong Pavilion. Not remaining a secret for long, the one secret burger turned into a dedicated burger menu at the venue, which went on to spearhead the openings of Grand Trailer Park Taverna, Truck Stop Deluxe and Royal Stacks. To pay homage to the brand that kick started the burger phenomenon for Royal Stacks, Flip City Burgers has returned, exclusively available via UberEats in Melbourne CBD and surrounding suburbs. B urger lovers can expect the likes of the RKO Burger, featuring two premium, Aussie beef patties minced fresh daily, melted double cheddar cheese, beer battered onion rings, coleslaw, garlic and paprika mayo, in a brioche bun. Grand Trailer Park Taverna and Royal Stacks fans can expect some of their favourites, including the Francis Underwood Burger, which features the legendary mac and cheese croquette and the McDowell Burger featuring Swiss cheese and horseradish and shallot mayo, all with fat chips included. Recognising that the brand needs to cater for its delivery method, a special oven and a new type of bread is being used for maximum heat retention, ensuring the burger is delivered as fresh, tasty and hot as possible. The burgers are also bigger than the ones found at its sister brands. With the Flip City Burgers brand originally being kept a secret, the team decided that relaunching it exclusively on UberEats was a great way to give customers a premium product that can’t be found anywhere else. In keeping with the team’s ethos, all the ingredients are locally sourced and the beef is minced fresh daily, and completely free from GMO, hormones and antibiotics, and supplied by Vic’s Meats. The menu has been created by executive chef Terri Tep. With 15 years experience in the kitchen, including eight years working with Dani Zeini, Terri brings a wealth of burger knowledge. Terri’s signature mac and cheese croquettes have become a firm favourite and her burgers have created a cult following wherever she goes.